When you create or open a project, one of the first panes you see is the Catalog pane. The catalog view is open and active if you create a new project using the Catalog blank project template provided with ArcGIS Pro. 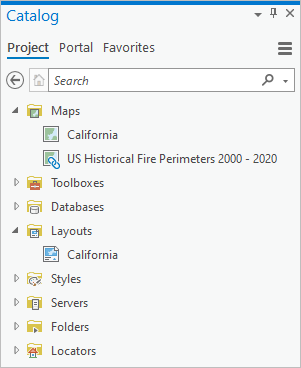 The Catalog pane and the catalog view allow you to access all items associated with a specific project in one place, whether they are available from a local or network computer, ArcGIS Online, or an ArcGIS Enterprise portal. Discover GIS content on local networks or your organization's portal. Connect to databases and servers. Favorite frequently used folder, database, and server connections. Create and import maps, scenes, layouts, tasks, and other items. Preview an item's data and create a thumbnail. Describe your project and its items. Manage items in a project, geodatabase, toolbox, folder, or style. As you build your project by adding maps, scenes, layouts, connections to folders, geodatabases, and so on, these items appear on the Project tab in the Catalog pane and in the Project collection in the catalog view, categorized by type. The Catalog pane and the catalog view are designed toward different tasks. Both the pane and the view can be open at the same time, but they operate independently. You can switch tasks without losing your place. For example, you can edit symbols in a custom style in the catalog view, and pause in that work to add layers to a map using the Catalog pane. The first time you browse to a location, the contents list accurately reflects the items present. If its contents are changed outside ArcGIS Pro or by someone else, you must refresh the location's content to see that change. For example, press F5 to update the list. The Catalog pane has tabs across the top that provide access to collections of items. The Project tab provides access to the collection of items in your project; it's selected by default. The Portal tab provides access to collections of online content available from the active portal that you have permission to use. The Favorites tab allows you to collect frequently used folder, database, and server connections, and add them to your project. The History tab provides access to the geoprocessing history and raster function history for the project. List all items in many containers at once. Search for items by typing keywords in the Search box and pressing Enter. Hover over an item and a pop-up appears showing its location, title, thumbnail, tags, and modification date if pop-ups are enabled and these details are available. Ctrl+click or Shift+click many items to select them all, and add them all to a map at once, for example. The Catalog pane docks in the ArcGIS Pro application, providing access to items in your project and the active portal while you work. After browsing or searching for content, you can drag layers onto maps, datasets onto tools, tools onto models, and so on. In the Windows group, click Catalog Pane . If the active view is the catalog view or the map view, the Copy Path button is available on the ribbon. In the Catalog pane, select the items whose path you want to discover. Select items referenced by the project, items accessed from a folder connection, portal items, or favorite items. Click the Copy Path button on the ribbon, in the Clipboard group. If the catalog view is active, click the Catalog tab on the ribbon. If the map view is active, click the Map tab on the ribbon. The Catalog pane shows a pop-up by default when you hover over an item. Hide it if you know your data and you find the pop-up gets in the way. In the Options group, uncheck Show Pop-ups to hide the pop-up. In the Catalog pane, click the Menu button and check Show Pop-ups to see them again. Some items show more information than others in the Catalog pane's pop-up and the browse dialog box's details panel. All items can show their title, type, and location. Portal items can also show their owner. Most items can also show a modification date. When you're working with a new or unfamiliar collection of items, it may help to see more information. When you choose to see more detail and you browse local and network items, the Catalog pane's pop-up displays an item's thumbnail and tags. When you browse portal items, the browse dialog box's details panel shows an item's summary. After enabling the option to see more information and browsing the local or network location in the catalog view, the additional information will be available in the pop-up and the details panel. On the View tab, in the Options group, check More Detail. Browse to the folder in the catalog view. In the Catalog pane, browse to the same folder and hover over the item to see its pop-up. For local and network items, the additional information must be extracted from the items' metadata, if it exists, which will slow browsing. Browsing portal items is not affected. The Project, Portal, and Favorites item collections are available in the catalog view as well as the Catalog pane. When the catalog view is active, switch between the categories and collections of items in the Contents pane. Items in a collection or category are listed in the catalog view. The columns display type is well suited for managing your items. An item's name, type, and modification date, and a portal item's owner, are listed. The contents list can be sorted using any column. The tiles display type in the catalog view provides a gallery experience for exploring items. 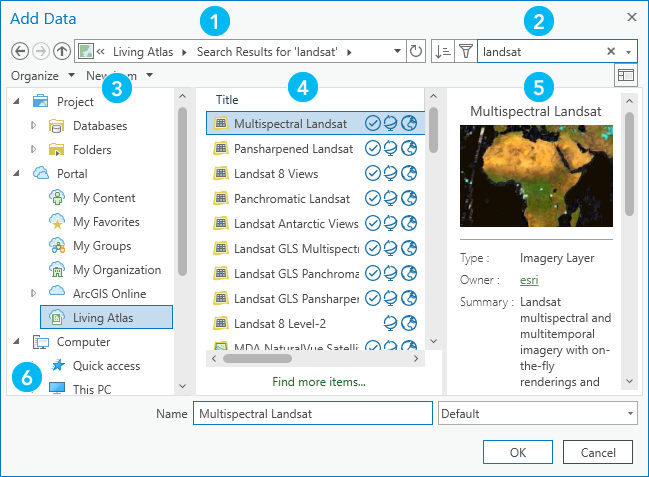 This can be helpful if you aren't sure which item to use, especially if you're accessing the active portal for the first time or if you use ArcGIS Pro infrequently. You can immediately see an item's name, type, thumbnail, and date if this information is available. Additional information is available in the details panel. The Metadata tab displays metadata for most items. For spatial datasets and maps, the Geography tab allows you to visualize the data. For tabular datasets, the Table tab allows you to visualize the data. For a style, you can preview the symbols, scale bars, north arrows, and other style items it contains, and modify a style item's properties in the details panel. Right-click in the white space around the contents list to access the context menu for the current location. Click the Show/hide details panel button in the upper right corner to hide and show the details panel. Use the Categories menu to browse collections in the Living Atlas. Use the toggle button in the bottom corner of the view to switch between the columns and tiles display types. Click Folders or My Content, for example, and click in the Search box. Type the name of the item you want to find and press Enter. Click the item you want to use in the list of search results. Manage your items in the catalog view. The buttons on the Catalog tab on the ribbon update dynamically to reflect what you can do in the current location or with the selected items. Some project item categories may also offer a contextual tab with additional options for managing items. Create items in your project or in items referenced by your project. For example, create a folder on a local or network disk, or in My Content. Add items created with ArcGIS Pro to your project. For example, add a layout that was saved to a file (*.pagx); maps associated with the layout are also added to the project. Import items created with other applications to your project. For example, import a 3D map from an ArcGlobe document. Copy or move project items. Upgrade a style and modify style items. Create a thumbnail for an item with spatial data. Edit the selected item's metadata. Repair project item connections that are invalid. The Location bar at the top shows your current location. Click the bar to copy the location's path. Click a place in your current location's path on the Location bar to browse to that location. Click a drop-down arrow on the Location bar and click a place in the menu that appears to browse to that location. Paste or type a path to another location onto the Location bar and press Enter to browse to that location. A folder connection is added to the project if the location is not already available in your project. Click Up to go up a level in the current collection's hierarchy. Click Back to return to your last location. Click Forward to return to a previous location. The Catalog pane does not directly interact with the catalog view. That is, browsing, searching, and selecting items in the Catalog pane has no effect on the location or the selected item in the catalog view. However, if you add or remove project items such as a folder connection in the Catalog pane, the contents list in the catalog view is updated accordingly. From the ribbon, you can open several catalog views and use them to compare the contents of databases or folders, compare metadata for two items, copy style items from one style to another, and so on. In the Windows group, click Catalog View . A new catalog view opens. Any existing catalog views and the Catalog pane will remain open if they are present and will continue to provide access to items in their current location. When you switch to a task that requires or is more easily performed in the catalog view, the Catalog pane may seem like it's in the way. In the Catalog pane, click the Menu button . Click Switch to View . The Catalog pane closes and the catalog view opens. If you need more room in the catalog view, you can, for example, undock it and place it on another monitor. You can also use Auto Hide to temporarily hide the Catalog pane if you leave the catalog view docked in the ArcGIS Pro application. Or, close the Catalog pane entirely. 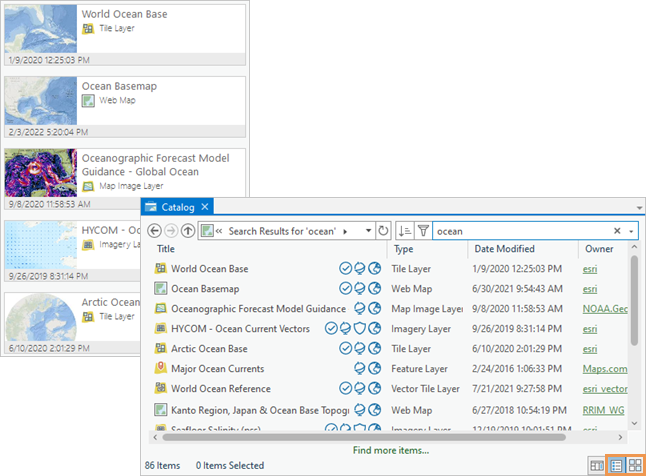 When browsing the contents of a folder in the Catalog pane and the catalog view, items are arranged by default into groups as follows: folders, databases, toolboxes, CAD datasets, GIS servers, spatial datasets and maps, tables, and then other files. Each group has items listed alphabetically in ascending order. You can change how items are sorted. Different properties are available for sorting different collections of items. For items stored on a local or network disk, items can be sorted by name and type, and a modification date is available for some items. When managing the contents of a style, style items can be sorted by name, category, and key. You can change the contents list back to its default presentation at any time. On the Catalog tab, in the Organize group, click the Sort drop-down arrow. Click one of the item properties that is available to sort the items in your current location such as Date. The contents list is sorted using the values in the specified column. Items are listed alphabetically in ascending order for all properties except Date. When Date is selected, items are listed in descending order by date, that is, with the newest item listed first. To reverse the order in which the items are sorted, click the Sort drop-down arrow and click the property again. To revert to the original order in which items were listed, click the Sort drop-down arrow and click Default Sort. When using the columns display type, click a column heading to sort the contents list by that information. Click the heading again to reverse the order in which the items are sorted using that column's values. The catalog view uses the columns display type by default to make it easy to find and manage familiar items. If you're working with unfamiliar data, or if you're managing the contents of a style, change the catalog view to use the tiles display type instead. On the View tab, in the Options group, click Display Type and click Tiles to see item properties on tiles. Click Columns on the toggle button in the bottom corner of the catalog view to see item properties in columns. The details panel is open by default in the catalog view. Hide the details panel to show more tiles or make columns wider. Show the details panel to learn more about a specific item and preview its data. On the View tab, in the Options group, uncheck Show Details to hide the details panel. In the catalog view, click the Show/hide details panel button to the right of the search text box to show the details panel. The browse dialog box allows you to select an item in your project, a portal item, or an item outside your project to use for a specific task. When you click the Add Data button on the Map tab on the ribbon, the browse dialog box appears with the title Add Data. The browse dialog box allows you to explore items in a manner similar to the catalog view. Quick links provide access to the available item categories and collections, but do not expand to list their contents. Item properties are displayed in columns that can be used to sort the contents list. A brief portion of the selected item's metadata is available in the details panel along with the item's location and owner if the selected item is accessed from the active portal. The browse dialog box also includes a Computer collection that allows you to browse to and select items from locations on the local computer or the network that are not currently included in your project. This capability allows you to add an existing file geodatabase to your project or import the contents of an ArcMap document, for example. Search is not available when you're browsing the computer. Click the Location bar or click in the Name text box to paste or type the path to a new location and press Enter. The dialog box browses to that location. If the location is not accessible from the computer's local or mapped network drives, the network location is accessed and the items it contains are listed; the location is not added to the project as a folder connection. Paste a full path to an item, including the item's name, into the Name text box to immediately select that item. For example, paste a full path including a table's name to add it to the current map. When the Groups or All Portal quick links are selected, click the Search My Organization button in the upper corner of the dialog box to include only items from the active portal that are provided by your organization in your search results. When items are listed on the browse dialog box, they are filtered according to the specific items that can be used to perform the task at hand. For example, when adding data to a map, only items that can be added to a map will appear. When importing items to a project, only items that can be imported will appear. Only the item categories and collections that are appropriate to the current operation are available to you. In certain circumstances, the browse dialog box allows you to further refine the contents list by choosing a more specific filter. For example, if you want to add a specific type of item to a map, you can select a filter that lists only that type of item. 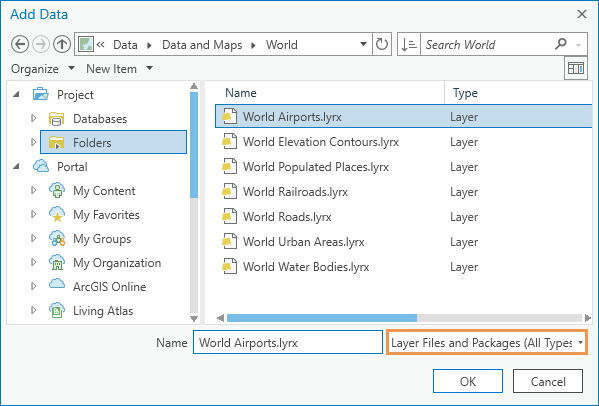 Sometimes the browse dialog box is used to provide access to a specific type of file that is otherwise not available in ArcGIS Pro. For example, many geoprocessing tools import data from or export data to external data formats. These tools may accept any type of file as input to a parameter, for example, by allowing files of type *.*. In this case, the browse dialog box may list all available item categories and collections, and show all types of items and files even though the title of the dialog box and the filter indicate you should select a specific type of file. In this way, you can select any file with any extension that contains data in the specified format. Limited capabilities are available for managing your items in the browse dialog box. Create a new folder on a local or network disk, or in My Content.